A general diary of gardening & landscape observations. I have a small 5′ x 8′ landscape trailer I’ve used for over a decade, if not 15 years, to haul all sorts of things, including a leaning tower of computers on a 450 mile journey. It has served me very well all of those years, and I hope to use it for many more. Well, this handy little trailer has specifications allowing it to handle 3500 lbs. of weight. Considering it’s served almost it’s whole life behind my 1995 Kia Sportage, which can only handle 2000 lbs for towing IF the trailer has brakes (and the trailer doesn’t have brakes), it’s not really had to be taxed to it’s limit, until recently. In the last couple of weeks, I’ve moved to towing with my Kia Sorento, able to tow 3500 lbs. Before I go further, I might mention some facts about the tires on the 14″ wheels. The trailer has two, one on each side, and each is labeled to handle 1290 lbs, meaning together they can carry 2580 lbs. Hmm. So, a trailer weight capacity of 3500 lbs. could lead an engineering and physics novice such as myself to put too much weight on a 3500 lb. capacity trailer, now couldn’t it? Did I mention that these are the original tires that came with the trailer? Well, they are, and though they still have great tread, and the spare has never been used, I’m sporting tires composed of at least 10-year-old materials. “WHOA! STOP! !” I cried. My tires were almost flat to the ground, and I was panicking! I got out my tire gauge, and the tires (I hadn’t used the trailer in a season), were down to 20 lbs., not up to 35 lbs., their maximum. I stopped the loader from providing the third paid load and crippled away with two loads for the price of three. I turned into the nearest air station, found enough quarters, and filled the tires to about 30 lbs. The tires, though looking a bit stressed, looked okay, and I carefully drove home. “WHOA! STOP! !” I blustered. My tires didn’t look like they could handle another load! Maybe this driver had loaded the bucket more heavily? I don’t know for sure why it looked worse than the previous time (with proper tire pressure), but, nevertheless, again I slowly limped away with two loads for the price of three, and I carefully drove home. “Maybe I should do some research,” I thought to myself. One, can I get tougher tires? YES! I can purchase a tire that can handle 1760 lbs. (and still fit my fenders), or two for 3520 lbs.! Well, that almost EXACTLY matches the capacity of the trailer! Oh, but I’m going to be away when the order would arrive, so I will have to delay adding new tires until I get back. Good. To. Know. Two, just what does a yard of mushroom compost weigh? Well, a yard can be up to 600 lbs. Wow! Still, If I only get 3 yards, that would only be 1800 lbs., right? Why do my tires look so stressed? Oh, well. I’d better, for the time being, just stick with two yards. Maybe the tires are showing their age. Enter today! Following the scenario of two weeks past, I drove around to the loading pad where the Bobcat driver promptly loaded one… two-three!!!!! “Arrrgghhh!! STOP!! I only purchased two,” I hastened. My 10-year-old tires are looking mighty sad, and I am, too, right about now as I give the Bobcat driver my gracious thanks, while, at the same time my heart goes into palpitations. “How am I going to make the 64 mile trip home?” I mused. “At least I now know why my tires looked so stressed last time.” I then, under my breath, honestly asked God to get me home with special attention to my safety and others’. Here, at home, safe and sound I write, less than two hours after returning. Attribute my safe return at your own discretion, but it is as it is. Somehow, with only the ability to haul 2580 lbs., my tires hauled, today, at least 2700 lbs. of compost plus trailer weight, which I imagine to be around 300 lbs. The leaf springs under the trailer, two inches from the axle when not loaded, were about one inch from the axle. After all, they could have handled 500 more pounds, if it weren’t for my tire limitations. So, now that I know how much is actually loaded from their Bobcat bucket, one-and-a-half yards, and not one yard, I know that, over the life of this witness, I paid for eight yards of compost and drove out with 10 1/2 yards, getting a better bargain than I could have imagined. 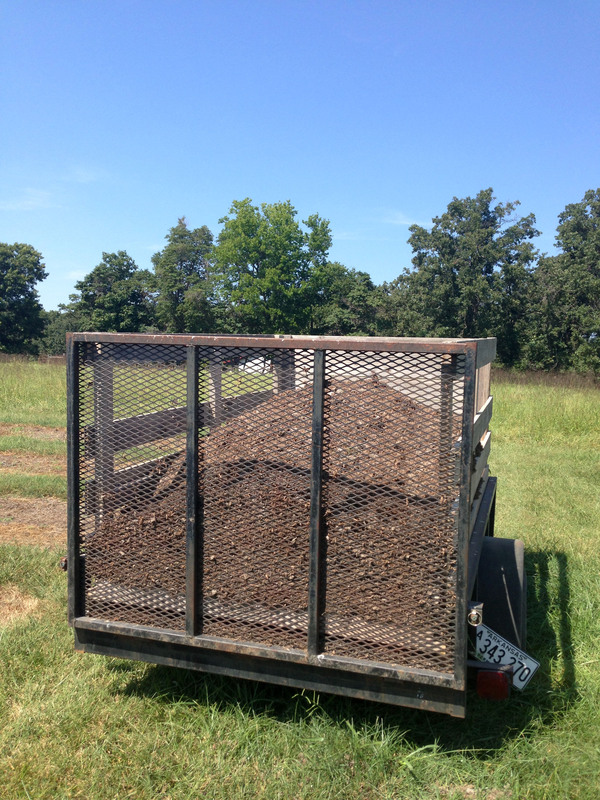 J-M Farms, Inc., is a great place to buy mushroom compost! Not only is the current going price of $15/yard a bargain, they are intentionally generous by attributing one yard to a one-and-a-half yard bucket. Don’t go there expecting them to load extra buckets, by the way. They had a lot of compost, and concerning a line of customers for pickup, the crickets were singing today. This is not their usual scenario. I love, however, their standard scenario, as the philosophy does it’s best to provide more than required. Why write about this? Therapy. My heart rate has gone back to a normal hop, skip, and jump. Time to prepare more flower bulb beds for transplanting! Nursery Trials & Forward Thinking! What a year it has been! With this past winter we saw record matching lows, reaching down to -15°F!! If that wasn’t enough, this spring we saw 13″ of rain in a span of 10 days!!! And, if THAT wasn’t enough, this summer we experienced a 6 week drought with many, many days over 100°F, with the highest reading being 107°F (IN THE SHADE)!!!! Ah, but the things we get to learn through trial. So, what did I learn from record matching lows? That FreezePruf™ will definitely remain a part of my winter maintenance schedule. I will be posting about this season’s anecdotes shortly. That some flower bulbs are just WAY hardier than common wisdom dictates. I was thrilled to see survival and thriving spring growth in species I never imagined could survive. And, how about all that spring moisture? Well, the main thing I learned was that it is best to keep up with weed control as much as possible. That I may want to look into some simple, organic fungus and bacterial controls to encourage flower bulb foliage health. This is an issue faced to one degree or another, even under normal moisture conditions. Finally, were there lessons learned from intense summer heat and drought? This is a good reason to have a permanent irrigation system in place, though, under normal circumstances, irrigation is not all that important for most flower bulbs. Wear a HAT, Crazy Man!!! I have not been promoting sales aggressively for about three years, now. The bulk of my business, in years past, had been through dormant import sales, and that avenue of marketing had become untenable. So, I watched my nursery to see how it would perform, since a number of species were only in the nursery as leftover stock from unsold dormant import inventory. The last few years have brought some very extreme weather conditions which have been a true test for hardiness and bulb durability in our area. I have been encouraged with that success. I am also encouraged by how well some of those products have appeared to increase in the beds. This will lead to some mass diggings, dividing and re-plantings over the next couple of years, and this should make some of my bulbs available at lower prices for short periods of time. I have the parts received for repairing my bulb digger, so I’m all set to get digging! Due to these circumstances, I have been actively marketing again at a level that will allow me to keep up with requests. This has me looking toward the immediate future as a period of slow growth and added nursery improvements to facilitate efficiency. I hope you will also take note that I do have a presence on Facebook. Please click the image and give us a “Like". I wish to give my heartfelt thanks to those who have remained loyal customers through my lack of public communication. Not all trials are bad for us. They provide information to help with adaptation or making improvements helping folks learn and grow. It’s time to grow forward! I’ve been quite curious of late about the popularity of blogs. Why have one? How does it replace a forum posting, or is it really any easier than publishing an article to a web page? Well, I got tired of wondering, so I began to wandering. Fact is, I began my wanderings all the way back in June of 2007, I installed this particular blog software, b2evolution, then got bogged down in the concept of configuration and template tampering, got busy with fall product lists, got lazy after that, and just finished publishing the spring flower bulbs list a couple days ago. So, here I am, planting the seed. I’ve rooted around in this program enough to get a template made that mostly fits the feel of the rest of my site, and I hope to have a short article posted by the end of the week. As time goes by, I hope this seed will grow, allowing me to share thoughts and ideas from general gardening observations and practices to rambling on over into the specifics of flower bulb studies and culture. Another feature I do not understand very well, coming along in popularity with blogs, is the “RSS Feed". I hope, if you find these articles, thoughtful meanderings, and favorite links to be of use, you can also find the RSS Feed to be of service, too. This page is intended to reflect on observations made in and around the garden, landscape and nursery here at Bulbmeister.COM.